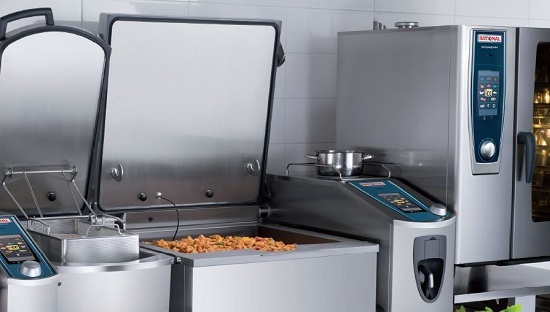 The leading provider in hot food preparation equipment. Here at RATIONAL we pride ourselves as a company of chefs for chefs. With just two appliances, a RATIONAL SelfCookingCenter combi oven and a RATIONAL VarioCookingCenter multifunctional unit, a professional kitchen can prepare everything that a modern menu demands. Together, the two appliances offer the best cooking solutions. Independent researchers at Zurich University found that, by switching from conventional appliances to SelfCookingCenter and VarioCookingCenter units, a kitchen reduced energy consumption by 34% and water consumption by 53%. Moreover, the new kitchen appliances were able to produce more food from less space. Training is offered to help chefs get the most out of their RATIONAL appliance. On-site training is available once an appliance is installed There is also a variety of educational programmes such as live cooking demonstrations, where caterers can see the products in action, and academies, which are popular with chefs who undertake regular training and want to keep up-to-date with current techniques, trends and preparation methods. There’s also the Training and Resources App, which was developed following feedback from customers. The App combines a vast array of training resources, such as videos demonstrating how to cook specific recipes or showing how to carry out day-to-day maintenance tasks, and a searchable database of dealers and service providers. The App is smartphone-friendly and can be used in the kitchen, making it an ideal tool for new starters or refresher training, as well as for learning about more advanced techniques. RATIONAL’s ConnectedCooking technology connects the SelfCookingCenter and VarioCookingCenter to the internet, giving chefs the ability to monitor and control their RATIONAL appliances remotely, on a computer or mobile device. They can change recipe programs, monitor cooking processes and download free software. Meanwhile, maintenance can check how the equipment is running from a smartphone or PC, and the system will automatically notify their designated service partner if there is a problem. Once registered, chefs can also access a comprehensive library of recipes and application videos. RATIONAL are supported by a national network of dealers and accredited service partners that deliver the highest possible standards of service.